Posted May 21, 2018 by Town Hall Terrace & filed under Grand Island, Summer Activities. There’s nothing that says “summer on Grand Island” quite like a family outing at Fantasy Island. This historic amusement park has been a seasonal staple of the community for more than 50 years, and this year Fantasy Island will unveil a new addition to its lineup of attractions—a kid-centric area called the Fairy Tale Forest. 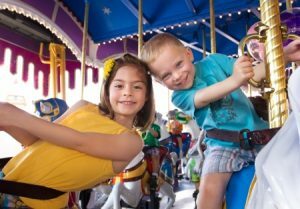 In addition to opening the Fairy Tale Forest, Fantasy Island has made a number of other improvements and upgrades to the park this year as well. Two of the park’s original water slides have been renovated, for example, and the Golden Nugget has reopened as a saloon that serves locally-brewed craft beers from throughout the region. The park’s menu has also been updated to include new treats like funnel cake fries, hand-dipped ice cream and fried dough. Fantasy Island is open on weekends from now until June 17, at which point it will open seven days a week for the rest of the summer. Don’t miss out on this fun and family-friendly destination conveniently located right down the street from Town Hall Terrace! Treat Mom to One of These Great Mother’s Day Events! Posted May 11, 2018 by Town Hall Terrace & filed under Things to Do Around Town Hall Terrace. Still looking for something to do with the most important woman in your life this Mother’s Day? You’ll have no shortage of options here in Western New York! This weekend, businesses throughout the region will be hosting fun, family-friendly events in honor of Mother’s Day. Check out a few of our favorites below! From 10am to 3pm on Sunday, guests can enjoy browsing a pop-up market on the second floor of the historic Hotel Henry in buffalo. Vendors will include local florists, jewelers, candle makers and more. You can also enjoy a chair massage or a manicure from Rejuvinex Spa when you’re done shopping! If your mom is a music lover, be sure to check out the Motown Brunch at Thin Man Brewery! Located in the heart of Buffalo’s Elmwood Village, Thin Man will offer a diverse selection of locally-made beers, authentic gastropub cuisine and classic Motown soul courtesy of a live DJ. Moms and their kids can take part in a cupcake decorating party at Perks Café on Main Street in Buffalo. Each guest can decorate up to 6 gourmet cupcakes using buttercream frosting, fondant and edible décor. You can also enter to win a baking-themed basket and your very own cupcake decorating party courtesy of Anything Arts. Whatever you decide to do this weekend, we’d like to wish you a very happy Mother’s Day from all of us at Town Hall Terrace! Posted May 4, 2018 by Town Hall Terrace & filed under Things to Do Around Town Hall Terrace. April showers are finally giving way to May flowers here in Western New York! This weekend, you can enjoy a lively display of spring color at the annual Buffalo Cherry Blossom Festival in Delaware Park! Located in the park’s Japanese Garden, this event showcases the city’s cherry blossom trees in a peaceful, serene setting. If you’ve never visited the Japanese Garden in Delaware Park before, you can find it right next to the Buffalo History Museum. The weather during the event is expected to be mild and sunny—perfect for a relaxing day in the park. While you’re there, you can also enjoy many of the other attractions in and around Delaware Park! Just across the street from the Japanese Garden, you can take a stroll around Hoyt Lake and take in the world-class collection of modern art at the Albright-Knox Gallery. Meanwhile, on the other side of the park, you can play a round of golf on a historic 18-hole course or visit the animals at the Buffalo Zoo. Widely regarded as the jewel of Buffalo’s Olmsted Parks system, you can easily spend an entire day exploring and relaxing in Delaware Park. 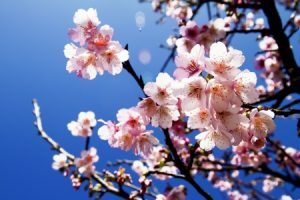 To learn more about the Buffalo Cherry Blossom Festival, you can visit the event’s official website here. This is just the first of many great events that will be taking place in Delaware Park this spring. Before too long, Shakespeare in the Park will return with a production of King Lear as well. For a sneak preview of this weekend’s cherry blossom festival, check out the video below! Posted April 26, 2018 by Town Hall Terrace & filed under Amenities. After spending a long winter cooped up inside, it’s safe to say we’re all ready to get outside and breathe some fresh air. Fortunately, there are a number of great outdoor amenities to enjoy right here at Town Hall Terrace. Backhand technique getting a little rusty? You can practice with friends on one of our beautiful outdoor tennis courts! 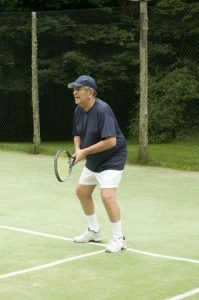 If tennis isn’t your game, you can also play a round of basketball at the courts right next door. After you’ve worked up a good sweat on the tennis courts, you can take a refreshing dip in our pool! Weather permitting, we keep the pool open all day long for the residents of our apartments, townhouses and patio homes. If all this activity is making you hungry, you can fire up the barbecue at our picnic pavilion and enjoy a home-cooked meal with friends. The picnic pavilion is also a great place to meet new people and mingle with the other residents at Town Hall Terrace. There’s also plenty of green space around the pavilion to keep kids entertained on sunny afternoons. Finally, we can’t forget about our four-legged friends. The dog park offers an opportunity for our pets to socialize with other animals and run off some steam. We have plenty of dog lovers in our community, so your pup will always have a companion to play with. Interested in learning more about everything there is to do at Town Hall Terrace? Give us a call today, and be sure to ask about our spring specials! Posted April 13, 2018 by Town Hall Terrace & filed under Things to Do Around Town Hall Terrace. Located off of Grand Island Boulevard just south of Buckhorn Island State Park, Kelly’s Country Store has been a staple of our community for more than 50 years. 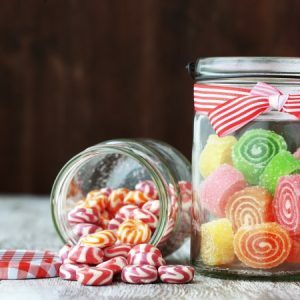 The store was founded in 1962, when Walter and Grace Kelly decided they needed a permanent space to sell the penny candy they had been bringing to local festivals and events. The couple purchased the original 20’ X 20’ store in exchange for their home and $1. Today, the third generation of the Kelly family continues to offer homemade candies, gifts, holiday items and home décor from their charming country store in the heart of Grand Island. All of the store’s chocolate and fudge treats are made on-site in three kettles. In fact, the store produces about 40,000 pounds of chocolate a year! You can also choose from 75 varieties of classic candy including licorice, root beer barrels and peach stones. And of course, it wouldn’t be a candy store in Western New York without sponge candy. When you visit Kelly’s Country Store, you can also take a tour of a beautifully renovated one-room schoolhouse located on the same property. Formerly known as “Old School No. 5,” this little red school house offers guests the opportunity experience a day in the life of a 19th century student on Grand Island. To learn more about everything Kelly’s Country Store has to offer, you can visit their website here. If you’re looking for a fun weekend activity, be sure to swing by and explore the store for yourself! Posted April 4, 2018 by Town Hall Terrace & filed under Things to Do Around Town Hall Terrace. The temperatures might still be a little chilly here on Grand Island, but that isn’t stopping the local anglers from making the most of the first days of trout season. The season started on Sunday, April 2, and fishing enthusiasts from throughout the region are already hauling in some pretty impressive catches. If you’d like to get out and participate in this year’s trout season, the state Department of Environmental Conservation (DEC) recently stocked Hyde Park Lake and Gill Creek in Niagara Falls with about 2,500 brown trout. The DEC also plans to stock the lower Niagara River, Lake Ontario and Oppenheim Park Pond with more than 80,000 brown and rainbow trout later this spring. Located just 15 minutes from Town Hall Terrace, Niagara Falls is a particularly popular fishing destination for anglers in our area. If you want to stay on Grand Island, you can also do some fishing in Beaver Island State Park. Be sure to get your fishing license first, though! You can easily apply for your license online on the DEC website. 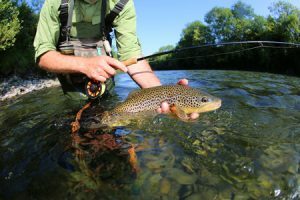 Trout season runs until October 15, so you still have plenty of time to get outside and enjoy the many great sport fishing spots in Western New York. Interested in learning more about everything there is to see and do around Town Hall Terrace? Stay tuned for more updates from our blog, or give us a call today to speak with a representative! We look forward to hearing from you. Posted March 22, 2018 by Town Hall Terrace & filed under Things to Do Around Town Hall Terrace. Spring has officially begun and Easter’s on its way. That means it’s time to visit the iconic Broadway Market in Buffalo! If you’ve never been to the market before, you’re in for a treat. First opened in 1888, the Broadway Market is based on traditional markets in 19th-century Poland. A lot has changed over the course of the past 130 years, but the Broadway Market has remained largely the same. The market is open all year, but it’s a particularly popular destination in the weeks leading up to Easter. 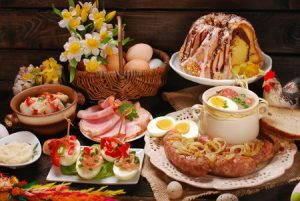 This time of year, you can find all kinds of traditional European Easter goods at the Broadway Market, from the famous butter lambs to polish sausage, pastries and more. The market will also host a number of entertainers throughout the season, including accordion players and Polish dancers. The Broadway Market has always remained true to its roots, but that doesn’t mean it hasn’t grown in recent years. Soon, the market will install a new commercial kitchen valued at half a million dollars in an effort to attract new tenants and vendors. The Market’s managers hope that the new kitchen will help make the historic property a year-round destination for the residents of Western New York. “We are going to outlast any forms of commerce that you ever did see and I’m very heartened by it, and the city believes in this place and it will continue and it will get better,” said Fillmore District Common Council Member David Franczyk during this year’s Easter season kick-off event. The Broadway Market will be open every day until Easter. Be sure to take a trip down to Buffalo to see everything this one-of-a-kind destination has to offer! Posted March 15, 2018 by Town Hall Terrace & filed under Things to Do Around Town Hall Terrace. Have you had a chance to visit the Aquarium of Niagara recently? If not, now might be a great time to check it out! This week, the aquarium is opening its new Humboldt penguin habitat which is more than five times the size of its former exhibit. This $3.5 million upgrade is the largest project ever completed at the aquarium, according to WIVB. The new exhibit features a 15,000 gallon pool and a rocky landscape that closely mimics the penguins’ natural habitat. It also has an interactive microphone system that allows guests to engage in live question-and-answer sessions with the aquarists working in the exhibit. 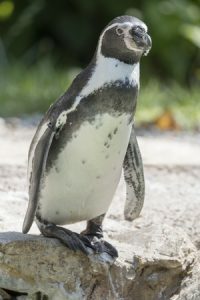 The habitat currently houses a colony of seven Humboldt penguins, but the aquarium plans to use the additional space to begin breeding more penguins by the end of the year. Ultimately, they hope to have a colony of about 20 penguins. The Humboldt penguin habitat isn’t the only exciting new addition coming to the aquarium in 2018. In May, work is slated to begin on a $440,000 jellyfish exhibit as well. Once complete, it will be the first permanent jellyfish exhibit in the aquarium’s 53-year history. The exhibit will reportedly house up to 70 jellyfish in illuminated cylindrical tanks, offering guests the opportunity to get an up-close look at the ethereal invertebrates. Next time you’re in Niagara Falls, be sure to stop in and see everything the aquarium has to offer! Posted March 8, 2018 by Town Hall Terrace & filed under Things to Do Around Town Hall Terrace. In 1915, Alan Herschell purchased a factory complex at 180 Thompson Street in North Tonawanda to support the growing needs of his budding wooden carousel business. Over the course of the next 55 years, Herschell’s company produce more than 3,000 hand-carved wooden carousels in the facility, establishing itself as one of the foremost manufacturers of carousels and other amusement park rides in the nation. Today, the former factory is home to the Allan Herschell Carrousel Factory Museum. Inside the museum, guests can visit the wood shop where Allan Herschell’s iconic carousels were brought to life. They can even take a ride on two of Herschell’s carousels that have been beautifully restored to their original condition. 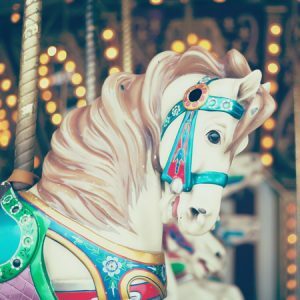 The oldest horses in the larger of the two carousels date back to the late 1890s. But Herschell’s antique carousels aren’t the only attractions in the museum. During your visit, you can also learn more about the many band organs that were produced in North Tonawanda by the Wurlitzer Company and its competitors. Get an up-close look at an antique Artizan “Style D” Band Organ, or check out the Wurlitzer Music Roll Department to watch early 20th century machinery produce paper music for historic band organs. The Herschell Carrousel Factory Museum has a little something for everyone. Whether you’re a local history buff, or just looking for a fun and educational place to take the kids, this museum is a great destination to consider. Located just 15 minutes from the heart of Grand Island, it’s perfect for a quick weekend excursion. To learn more about all there is to see and do in our area, stay tuned for future updates from our blog! Posted February 26, 2018 by Town Hall Terrace & filed under Grand Island. Earlier this month, Love’s Travel Stop, a national chain of truck stops, revealed that it had plans to build a new location on Grand Island. The news came as a surprise to both residents and local officials, and the response to the proposed truck stop was overwhelmingly negative. 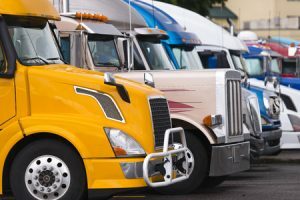 Many people were not only concerned about the effect a truck stop could have on public health and property values, but also about its potential implications for the local ecosystem. Fortunately for Mondich and other residents with similar concerns, Grand Island officials acted swiftly to prevent the proposed truck stop from taking shape. Last week, the Town Board voted unanimously to ban truck stops from being built anywhere on the island with an amendment to the town’s zoning code. This is just the latest example of Grand Island’s residents coming together to defend their community in a public forum. Thanks to this spirit of civic engagement, we can rest easy knowing the future of our town is in good hands. To learn more about what’s happening on Grand Island, stay tuned for the latest updates from our blog at Town Hall Terrace!